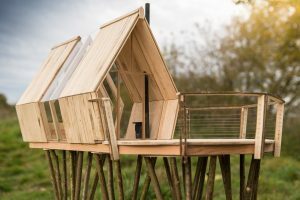 New Leaf Treehouses was founded in 2017 with the core principle of providing inspirational spaces that are ethically and environmentally minded from conception to construction. The company is is run by Joe Etheridge from West Sussex. 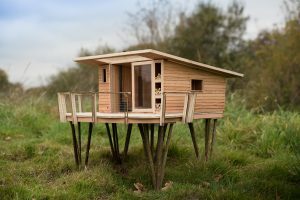 Since 2012, Joe has been professionally designing and making treehouses; he built five and a bird hide for a pioneering rewilding project at Knepp Castle near Horsham, and has spent time in the USA with internationally famed treehouse master Pete Nelson. 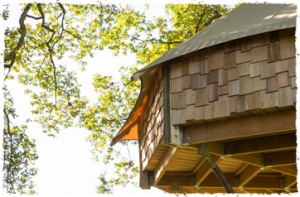 “My aim is always to design and install the best treehouses possible and to have a happy team behind me making it happen. The New Leaf Treehouse range now comprises three models, the 042, 084 and the 168. How the business started, this is our original design and build. the 042 was installed at Knepp Castle in West Sussex to great success as a part of their Rewilding project. The 042 comfortably sleeps two people and has various options for a wonderful outdoor living experience close to nature. The 084 builds on the principles established with the 042 but features an added deck for more entertaining. It also sleeps 2+2 (king size double plus 2 fold-out singles). Like the 042, it comes with a range of optional extras. The 168 is the newest model in the range and the largest, comfortably sleeping four (double plus pull-out sofa) and with even more entratining space. This model can even be upgraded to include a hot tub.